Adagio C105 ~ Ground floor, Corner unit, Gulf front! Updated 1/19! Gulf front, corner condo on ground floor at Adagio! 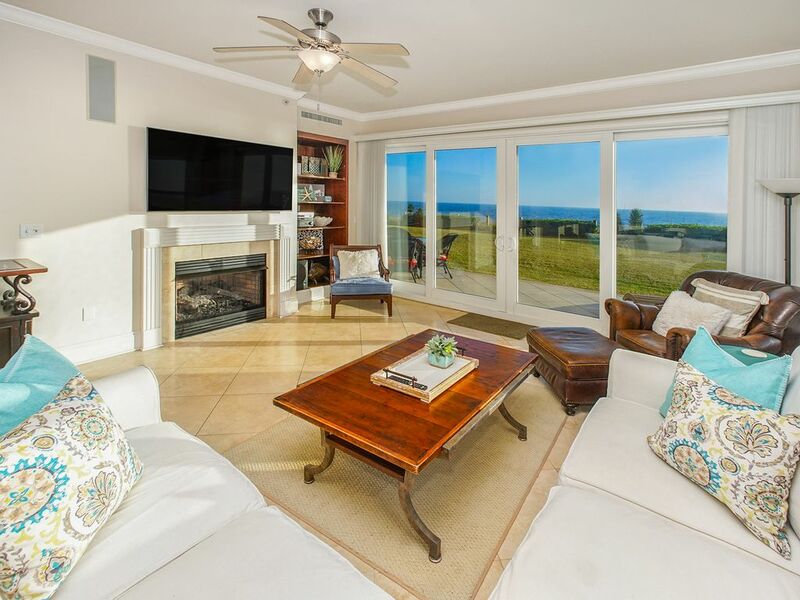 Our western end unit is lined with windows giving all but one room spectacular views of the Gulf of Mexico. The white sands and turquoise blue waters brighten our home by day and the priceless Gulf of Mexico sunsets glow throughout the walls with reds, oranges, and golds in the evening. Lounge on the patio overlooking the gulf while children play on the grassy area outside! We have taken great care to make our second home special for the select people who will enjoy renting it. Premium high thread count sheets and down comforters hide under the beautiful bedspreads. New 65" smart TV in living area and Smart TVs in other bedrooms. Dining for ten, and the Gourmet Kitchen is outfitted with top of the line stainless steel appliances, including an ice maker for your beachside coolers. Master bedroom with King size bed and private bath with jacuzzi tub, stand alone shower with double shower heads. Access patio with sliding glass doors. Second bedroom with King size bed and western Gulf views. Third bedroom with Queen bed and western Gulf views. Fourth bedroom with TWO Queen size beds and adjoining full bathroom. Full size washer and dryer in laundry room in condo. Drying rack, as well as iron and ironing board. On-site gym, open 7 am to 10 pm. There are four gas grills provided at Adagio. -Propane tanks or cookers are not permitted. Two vehicles permitted per condo~per HOA rules. -Please call us for options if you have more than two vehicles. Adagio's convenient location allows for quick access to neighboring Grayton, Seaside, and WaterColor where you'll find fabulous shopping and dining venues. The area also offers a spectacular 17- mile biking/hiking trail along historic beach highway 30A. The bike ride along 30A crosses some of the most spectacular inland lakes in the world. This is a first class property that is completely livable and usable. We hope you enjoy it as much as we do! Please call with any questions. Had a wonderful time at this beautiful condo making family memories ! Great overall unit and location. Unit was not clean upon arrival, and was quickly addressed. Fantastic week in Adagio Unit C105!! Beautiful view of the ocean. Our family of 8 enjoyed our week at Adagio in Unit C105! The owner was very helpful and gave us all the codes and information needed for our week. The unit was very well equipped with all high end appliances in good working order. Loved the seperate ice maker. The beds were comfortable. Plenty of comfortable seating for the family. Very nice patio area with a table and seating and lounge chairs. We had a beautiful view of the ocean and the beach. We were the end unit and so not a lot of people walking in front. We were close to the stairs to the beach. Love this area of the beach. We will recommend this unit to our friends. What an amazing view this unit had! We have stayed at the Adagio the past 8 years, but this was our first time in a ground unit. With two children, it was perfect. Bill was so easy to work with. One in our group became ill on the way to Florida and Bill worked to get us in the unit early! Would love to stay here again next year! My family and I have booked this condo every fall for the last 4 years. Best location at Adagio! Walked in to the unit after a long car ride and all the stress melted away. We were on vacation! Small issue with the bathroom, Bill had it taken care of in just a few hours. He is very quick to respond to e-mail, calls etc! The kitchen was missing a few items, but unfortunately that is expected with rental units. Thank you for sharing your piece of paradise with us, Bill! We are already booking for next year!